The Paper Work Didn’t Help! Nothing that was written on any piece of paper, actually helped anybody. A similar situation exists and is actually occurring daily with respect to the glass balustrade market, where people are installing systems which are not fit for purpose. The Paper Work is all Good! Systems are being installed that have all their “paperwork” in order, which states that it meets certain criteria or possible test information stating this, that or the other. In reality, I can tell you from my own experience, that these things don’t stand up to the tests of real requirements of the standards they are supposed to meet. We actually work with these standards and understand how they work. I have seen “tests” that show deflection numbers that cannot be real. I have seen glass thicknesses that we know for a fact cannot comply, being said to meet the standard. There are many amateurs out there installing systems and I have seen people fix structural balustrades to the decking. In practice many are not using the right fixings or correct materials. They’re not using the correct materials when it comes to connecting them to the building, so what happens when it comes to the actual practical real-life test and God forbid they fail, then questions will get asked. BS6180 requires that fixings are designed to be 50% MORE than the requirement. The reason for this is quite logical and that is to allow deformation to occur before failure. I have not seen in any paperwork or tests by other suppliers this being met. This can make the pieces of paper signing off the Balustrades the same as the ones used at Grenfell Tower. In the building industry we’re not the only area with this problem. The challenge is the cost of testing, we know because we have spent the money to do our own testing, so we know what it takes and what it costs – it’s painful! The trouble is less scrupulous people will work the system to get the required paper work, which leaves us in the Grenfell era of buildings being built on paper work and not on the actuality of what’s required. While everything goes along without any problems, everyone ignores the issues, and everyone agrees not to rock the boat and then every now and then a Grenfell Tower happens and all hell is let loose and people jump on the band wagon of we need to make changes. Let’s take an example of structural glass balustrades using 17.5 mm laminated glass, where I’ve seen pieces of paper stating that these meet the point load standard for 0.74 kilo Newtons per metre. So, allowing for the fact that the support along the bottom is rarely that good, how can that ever meet the regulation. Unfortunately, these exist. I’ve seen several buildings in Greenwich Square in London with 1000’s of metres of balustrading using this exact glass. The second thing is. 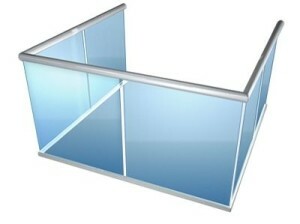 That using 17.5mm laminated glass means you have two plies of 8mm with an 1.5mm plastic interlayer (8+1.5+8 = 17.5mm). Once one of the 8mm pops the other 8mm will not be strong enough to withstand the load it has to withstand, making it not fit for purpose. We all know that prices effect decisions and whilst this can be ok in many circumstances, when talking about safety, how much do we put on the price of human life? When a large job requires a large quantity of balustrading which should be 21.5mm laminated glass or even 25.5mm sometimes and someone has paperwork showing 17.5mm is ok, (even though in the real world of practical application it isn’t) finances will dictate the use of 17.5mm over the thicker and compliant glass. So, I think the industry needs a wakeup call on the subject of balustrades and I know it’s unlikely that anything on the scale of Grenfell Tower is likely to happen regarding balustrading, but what if it was your family who lost lives.